Imagine my surprise (several years ago) when, in looking up census records for my mother's side of the family, I found a 3rd great grandfather who was a plumber! Line 7 shows James Freeland, age 35, with the occupation of Plumber. He owns no real estate and his place of birth is Scotland. Line 8 shows Nancy Freeland, age 30 and indicates that she was born in Ireland. Line 9 shows Mary Freeland, age 8/12, which implies that she was born in February of 1850, based on the date of this census, which is written in the header: twenty-ninth day of October 1850. She was born in Pennsylvania. The official enumeration day of the 1850 census was 1 June 1850. All questions asked were supposed to refer to that date, but other information I have confirms that Mary was born in February 1850. Mary Freeland is my 2nd great grandmother. See a photo of her and her husband here. Line 10 shows David Freeland, age 65, with the occupation of Weaver, and born in Scotland. Unfortunately, the 1850 census does not indicate the relation of members of a household to the head of household, but I am pretty sure that David is James' father. It looks like my third great grandfather was in the Freeland & Logan plumbing business on Federal Street in Allegheny in 1850. He is the only Freeland listed in that year's directory. James Freeland, age 39 (note his age did not increase by 10 years...), occupation Plumber, born in Scotland. He doesn't have any amount listed under either of the "Value of Estate Owned" columns, but I wonder if that was an enumerator omission. With a servant living in the home, he must have had some wealth. Emma Freeland and Edward Freeland, age 2: Note the word "twins" written vertically. Also in the household is a "Domestic" by the name of Mary McClintoc, age 20, born in Pennsylvania. 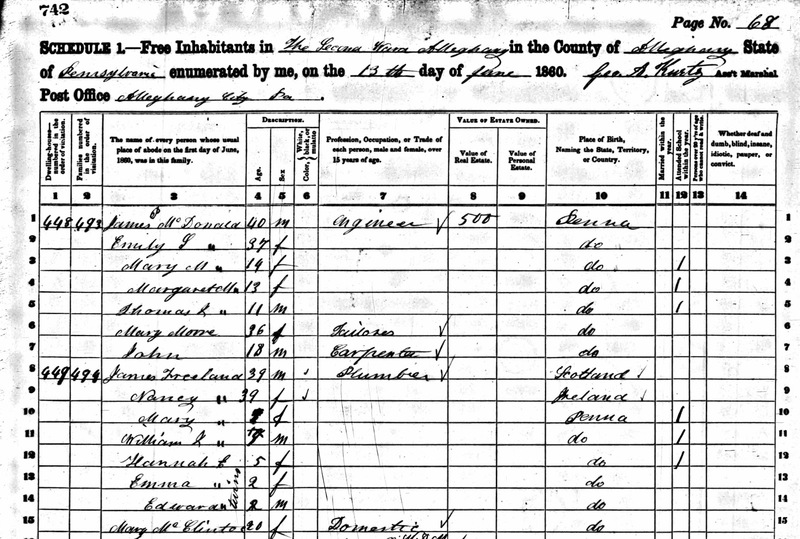 Nancy Freeland is listed as a widow in the 1870 census, so I know James died between 1860 and 1870. The 19th century brought a great deal of knowledge about the importance of sanitation, as well as plenty of inventions and improvements in plumbing. Unfortunately, all I know of my 3rd great-grandfather was his occupation of Plumber, as listed in these two census records; I don't know exactly what aspect of plumbing he was involved with.